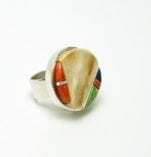 Hanson Smith Round Inlay Ring Navajo silversmith Moogie Smith creates jewelry with deep inlay. 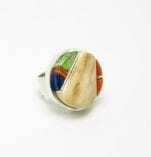 This round ring is inlaid with a large piece of fossil ivory, coral, lapis lazuli, and green turquoise. It makes a colorful and bold statement. This size 7 ring has a 1 in. diameter platform; band is 5/8 in. wide. Simple earrings, carved from fossil ivory by Nakwesee, who is of Cherokee descent, and whose family has been adopted by the Kwakiutl. Materials: fossil ivory with glass bead and sterling silver ear wires. Note that the brown portions ("bark" of tusk) are lighter than they appear in the photo. 1 1/2" x 5/8 Because of marine mammal protection laws, this piece cannot be shipped outside of the U.S.A.
Fossil walrus tusk bracelet. Held together with elastic cord, this bracelet measures approximately 2 1/4 inches in diameter, but stretches easily to fit on the wrist. The oval elements are approx. 1 3/8" x 3/4"; the rectangular ones are 5/8" x 7/8". 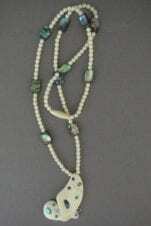 A bear necklace carved from fossil ivory by Nakwesse, an artist of Cherokee heritage, whose family was adopted by the Kwakiutl. The fossil ivory has beautiful coloration. Fossil ivory with inlaid ebony and copper. Bear is 2" x 1" x 3/8"; chain is 22 3/4" Because of marine mammal protection laws, this item can not be shipped outside of the USA. A charming frog pin carved from fossil ivory by Nakwesse, an artist of Cherokee heritage, whose family was adopted by the Kwakiutl. Fossil ivory with inlaid abalone and copper. 1 7/8" x 3/4" x 1/8" Because of marine mammal protection laws, this item can not be shipped outside of the USA. 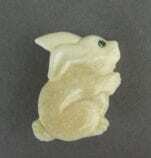 A charming bunny pin, carved from fossil ivory by Nakwesee, who is of Cherokee descent, and whose family has been adopted by the Kwakiutl. 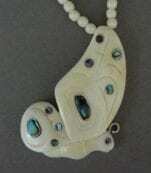 Materials: fossil ivory with inlaid abalone eye. 1 1/4" x 1" x 1/8" Because of marine mammal protection laws, this piece cannot be shipped outside of the U.S.A.